Love the stool . . . really do! And I enjoyed your creating! Nancy it's fabulous - agree the gnarly edge is what makes it special. 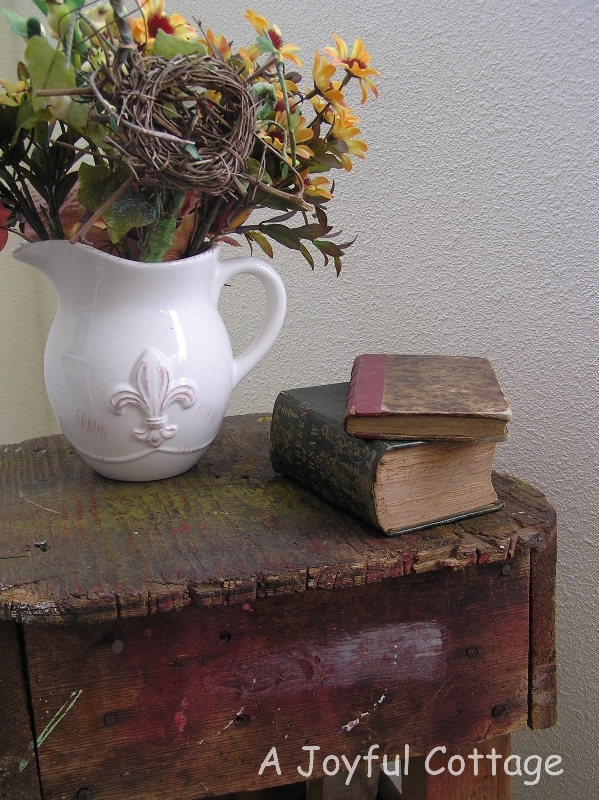 I love the pic where you added the jug with the fleur de lis and those books, the chunky one is really great! 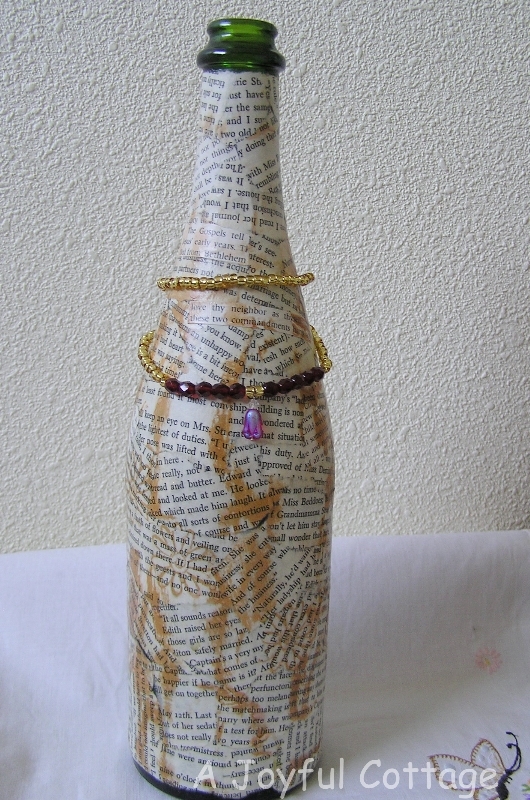 You did a nice job with the bottle - like the twine around the top. Thanks for the encouragement, Mary. Life just seems sweeter when I'm creating something. A definite score all the way around, Nancy! 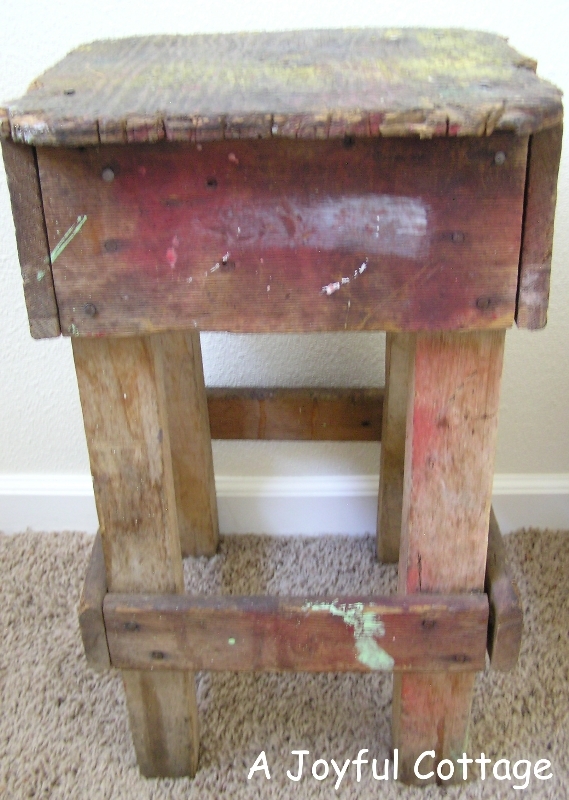 I love the stool...it is unique, crude and simply fabulous. I totally appreciate its simplicity and age. You paired it with the perfect accessories. Nice job on the bottle. One project and you are a decoupaging pro! I LOVE the stool. I can just imagine the stories it holds. Looks as if you chose the perfect word for the year! Aww, thanks Joan. I couldn't agree with you more about the stories. I believe that's one reason why I like old objects so much. 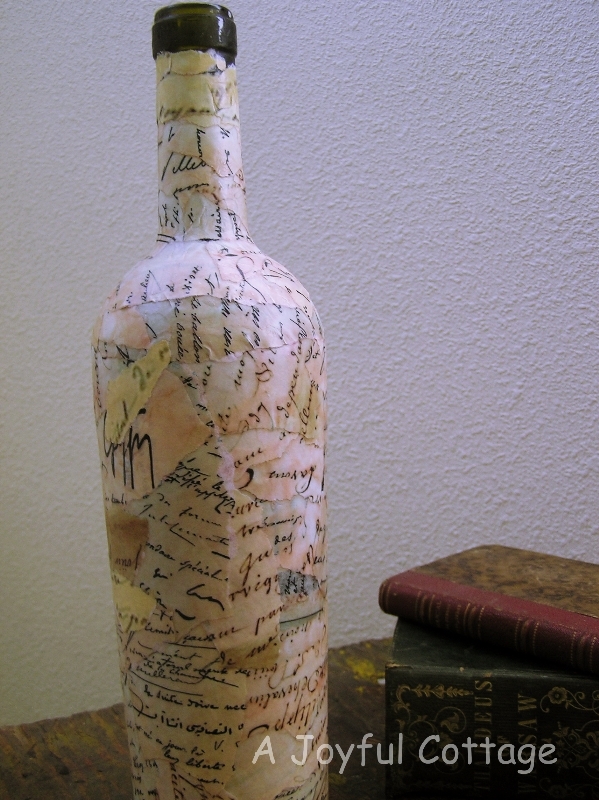 I really love altered bottles...great job! I also love the stool. What a great bargain! Oh, Nancy! I love what you did to that bottle! I am glad you added it to the Home Sweet Home party this week, I will feature it next week. It is brilliant! Oh, Sherry, thanks so much. You made my day! 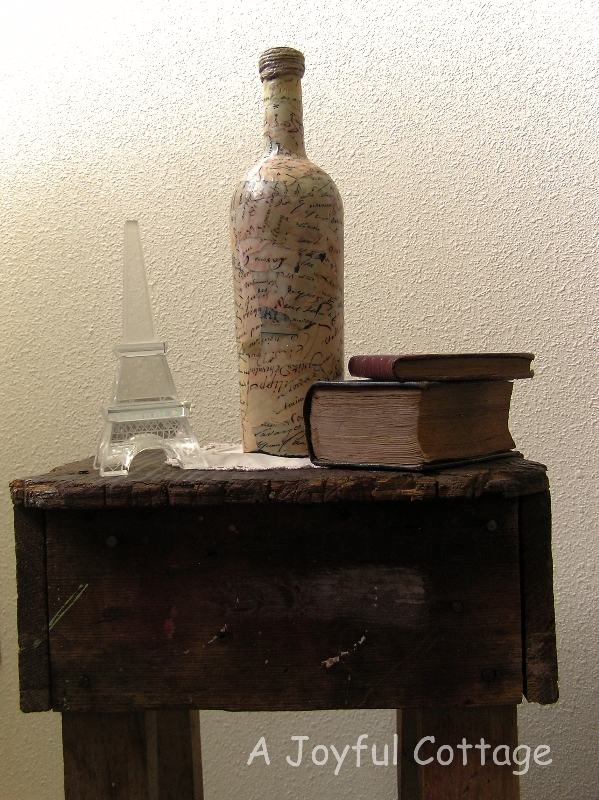 Your bottle looks so cute perched atop your new (old) stool.....found you at inspire me wednesday. Have a good week. 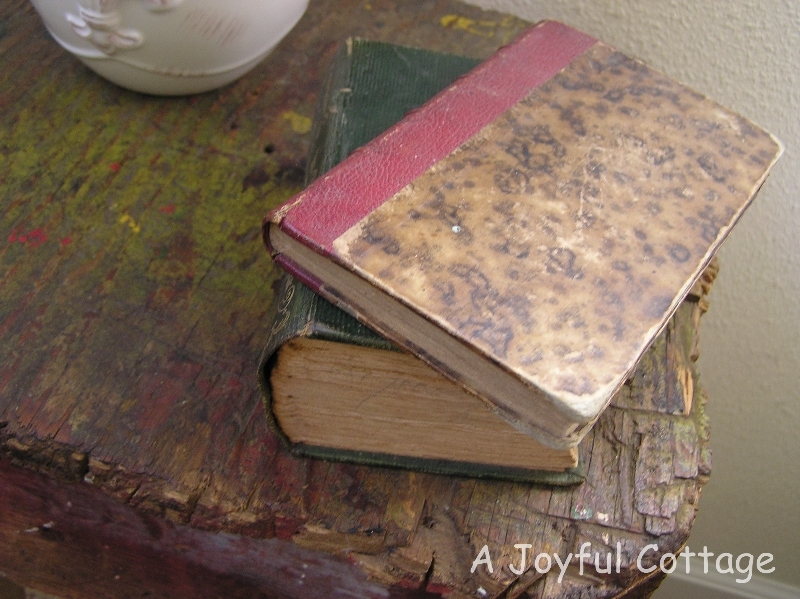 I can just imagine this vignette in a centuries old French cottage! 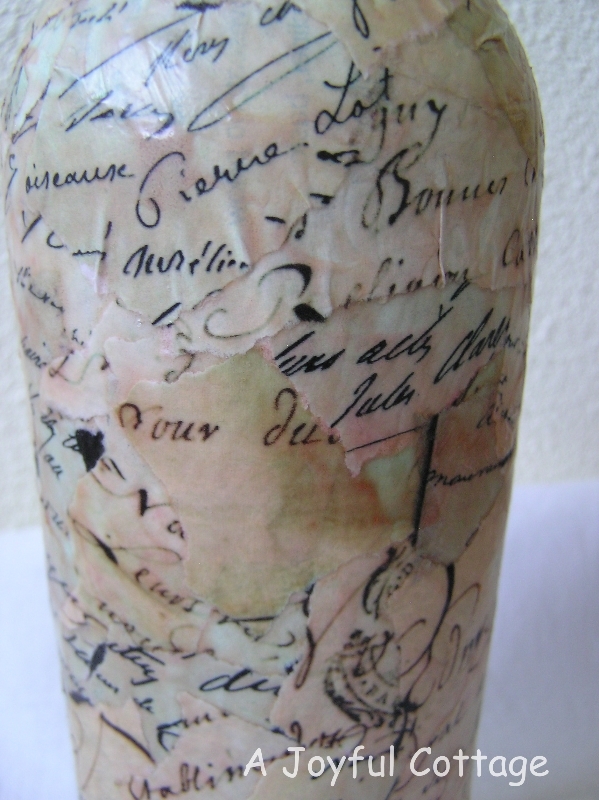 I will warn you - you can quickly become attached to the magic of Mod Podge. Donna, thank you. If you can imagine a vignette like that, then I've far exceeded my expectations. 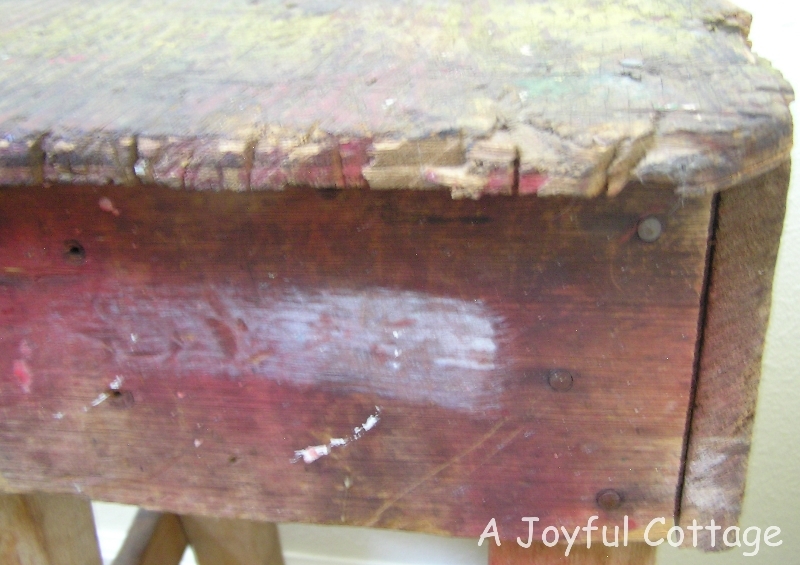 :) I think you're right about Mod Podge. I'm starting to look at plain little objects in a whole new light. Glad you stopped by! How nice of you to visit and leave such kind words. Thank you, and I will visit. Nancy, it all came together so nicely. Love, love that stool! Great job on the bottle. I like the bleeding effect too! Thanks for sharing it with SYC. How pretty - LOVE that stool - but I love how you pulled it all together even more! I have an affinity for Paris - so this is right up my alley!!! 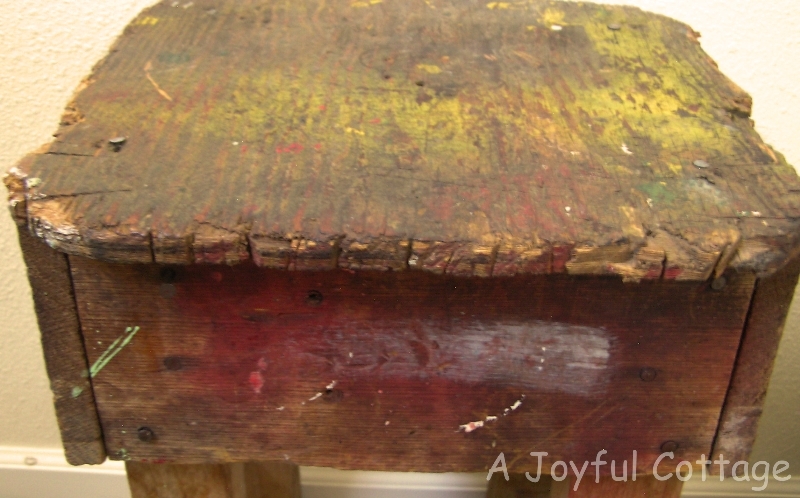 Sometimes the more beat up something is, the more beautiful it becomes. There is so much character. Thanks for linking to What We Accomplished Wednesday. Your link did show up. I hope you were able to see it. just hopping by to let you know that I will be featuring you at SYC this week. I saw your post featured at A delightsome Life. I have no idea how I missed it... I'm supposed to get your new posts by mail. Anyway, the vignette is absolutely lovely. 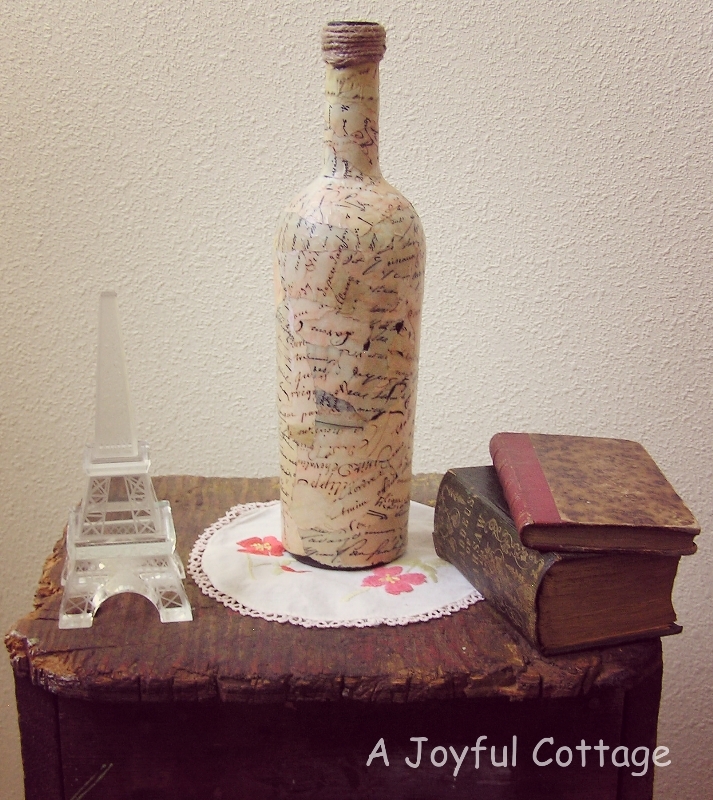 The stool is perfect and the decoupage bottle is a lovely creation and the "accident" made it even prettier. Aw, you're so sweet, Magali. Thank you. I've been on a French kick lately, and I know why. It's your influence, my dear. I have my husband the artist painting a French rooster for me. Yes. It's true. What a fun find and a great project! Love them both!